Have you ever made your own bunting? This Valentine’s Bunting is super festive and super easy to crochet. Choose any of your favorite yarns, and make four triangles. I went with candy colors but why not try soft pinks and purples or bold reds with black writing? 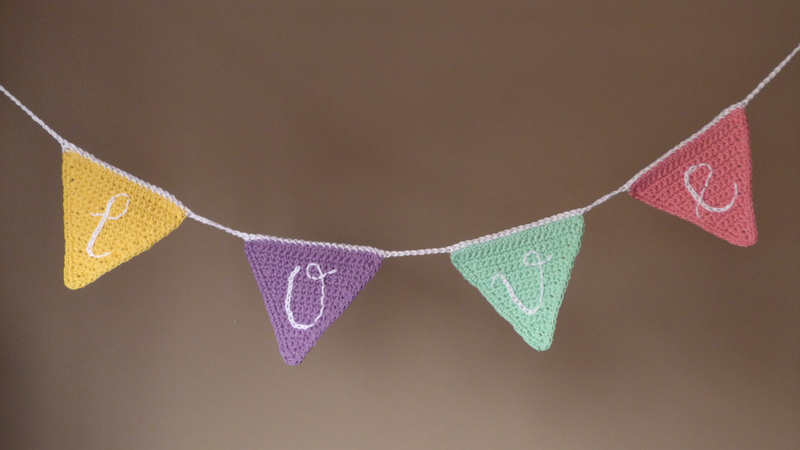 Don’t forget to check out Rachel’s Pennant Bunting and other garland patterns here at Crochet Spot! Sc evenly around. Finish off. The words are stitched onto the triangles using both surface crochet and easy sewing techniques. Decide which letter you want to be on which color. To achieve the handwritten font, use the white yarn and your crochet hook and crochet the thickest part of the letter. Then for the skinnier parts of the letter, use your yarn and yarn needle. Choose your own font or follow the style I selected by using the photo as a reference. With white yarn, ch 166 or chain until you reach 60”. Find the center of the chain by folding it in half. Lay the triangles where you want them to be on the chain and pin in place with stitch markers. Use a yarn needle and white yarn to whip stitch triangles to chain, picking up one loop of the chain and a back loop of the border stitches of the triangles. Let me know if you have any trouble while crocheting! This entry was posted on Monday, February 4th, 2019 at 11:26 AM by Amy	and is filed under Free Crochet Patterns. You can follow any responses to this entry through the RSS 2.0 feed. You can skip to the end and leave a response. Pinging is currently not allowed.